Back in the pack at four over par, he confessed that he will need a sackful of birdies and help from the weather to lift the Claret Jug today. But if he can’t win back-to-back majors, he’d be delighted to see his old mentor Clarke lift the Claret Jug. McIlroy said: “It’s fantastic. I saw him, he birdied the first hole today, which was good. Yeah, it’s great. As for his hopes of becoming the youngest Open champion since 1893, McIlroy was bitterly disappointed see his hopes all but disappear on a horrid day at Royal St George’s. “It’s a big setback,” he said. “I obviously wanted to go out and get myself closer to the lead and not further away from it. I wasn’t able to do that today. Paul Lawrie came from 10 shots off the lead to win at Carnoustie in 1999 but McIlroy knows he will need a lot of luck to pull off a dramatic comeback. “It all depends on the conditions,” he said. “If the conditions are decent, I could see myself going out and shooting maybe four or five under and getting in the hunt. His problem yesterday was failing to take advantage in a change in the weather having survived the horrific conditions for the first half of his round. He had problems off the tee all day and pulled tee shots at the first and third led to bogeys that left him fighting an uphill battle. When he hit a 375 yard drive just short of the fifth, he looked certain to make birdie but failed with an eight foogter after Fowler had holed a 20 footer for birdie. He made his only birdie of the day at the downwind, par-five seventh but bogeyed the eighth after tangling twice with the heavy rough on the left. 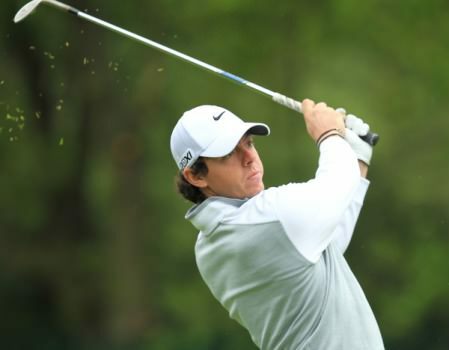 As the rain stopped and wind dropped he had a chance to close the gap on the leaders but pushed his tee shot out of bounds at the treacherous, par-five 14th and ran up a double bogey seven that all but scuppered his chances. “It was really tough out there this morning, and I felt for the first 13 holes to get through those in two over par was a pretty decent effort,” he said. McIlroy pulled his cap down over his eyes at the finish but his shoulders were already slumped after than body blow at the 14th. Fowler, his playing partner on each of the first three days, outscored him by six shots with a superb 68 to get to two under par and finish the day tied for third just two shots behind Clarke. And while McIlroy complained that Lady Luck turned her back on him as he got the worst of the weather in each of the first three rounds, he had to admit that Fowler’s round was impressive. 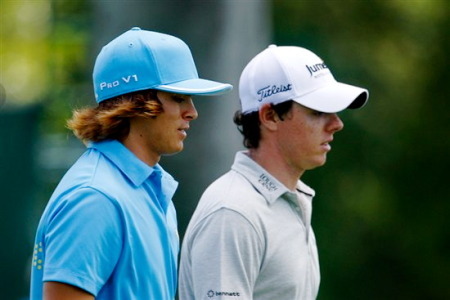 Rory said: “Rickie played really well. He’s such a natural player and he’s got a lot of feel, so he controls his ball flight very well. And he’s got a great short game. He gets it up and down when he needs to, holes good putts at the right times - 68 out there in those conditions was very impressive.